Each year, the Population Research Center at Portland State University publishes the population counts for Oregon and its counties as of July 1. These population estimates show the reasons why the population changed from the previous year. The change in an area’s population consists of two parts: net migration into or out of the area; and the natural increase, which results from the difference between the area’s number of births and deaths. 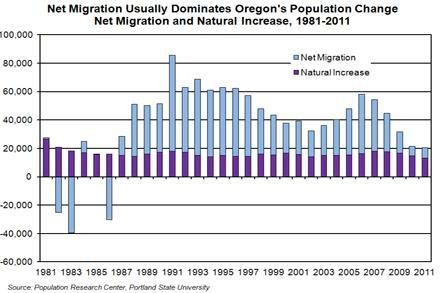 Net migration tends to drive Oregon’s population change in any given year, while the natural increase is a relatively smaller and more stable component of population change. Between 1981 and 2011, Oregon’s net migration over one year ranged from an increase of 67,700 residents to a decline of 39,500. During the same period, the natural population increase resulted in July-to-July gains between 4,100 and 26,600 residents. Beginning in 2009, natural increase took the lead with a larger share of Oregon’s population change (Graph 1). The cause is not a baby boom; since 2008 Oregon recorded fewer births from one year to the next. Nor have there been fewer deaths; the number rose slightly from 2009 to 2010, and again in 2011. Instead, Oregon experienced a large drop in net migration. Annual net migration tapered off through the Great Recession and sluggish recovery. It slid from 36,100 in 2007 to 6,900 in 2010, the lowest level seen since 1987. Net migration rebounded slightly to 7,400 in 2011, but still sat below the 1987 level, and remained at less than one-fifth of the level seen at the last peak in 2006. Historically Oregon has experienced its slowest population growth – and the few instances of population decline – as a result of net migration changes that coincide with periods of economic difficulty. Oregon’s seasonally adjusted unemployment rate sat above 8 percent every month from April 1980 to July 1986. Within that period, the rate exceeded 10 percent for 27 consecutive months, from October 1981 to December 1983. In 1982, 1983, and 1986, Oregon experienced the only population declines seen over the last 30 years. Among other reasons, some in Oregon fled the state in search of employment opportunities. Oregon saw annual population gains hit low points again around the time of the dot-com bust and the early 2000s recession. The relationship between an official recession and net migration in Oregon doesn’t solely or consistently explain net migration patterns. In 1991, Oregon experienced the largest net migration of the 30-year period (67,700); from July of 1990 through March of 1991, the nation was in a recession. Myriad other factors – such as a loss of value in retirement funds or home values of those elsewhere who would otherwise move to Oregon – also play contributing roles in net migration. 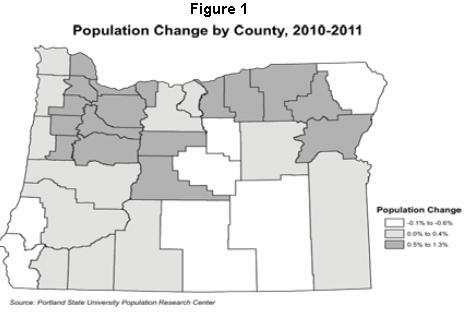 Portland State University also provides county-level population change by component, covering the period from April 2010 to July 2011. During that time, Oregon experienced net migration gain of 9,400 people. For those who are on the move into or within Oregon, the Portland tri-county area was the top destination. Clackamas, Washington, and Multnomah counties had a combined gain of 3,800 people due to net migration. 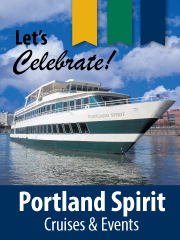 The other two counties that make up the Oregon portion of the Portland metropolitan area are Columbia and Yamhill. Factoring them in, Portland accounted for about 45 percent of the statewide net migration gain. Oregon’s other metropolitan areas were also among the largest in net migration gains. After the three core Portland counties, the Eugene metropolitan area (Lane County) and Bend (Deschutes County) had the fourth and fifth largest net migration counts. Overall, the 11 counties that make up Oregon’s six metropolitan areas captured 71 percent of the state’s net migration gain in 2011. The 25 non-metropolitan counties combined for a net migration gain of 2,700 people, or 29 percent of the total. Although metropolitan areas saw the lion’s share of net migration increases in 2011, they were slightly smaller than the metropolitan distribution of the state’s total population (Graph 2). Seventy-eight percent of the state’s population resided in metropolitan areas in 2011. That’s 7 percentage points above the metropolitan share of net migration between April 2010 and July 2011. Conversely, the non-metropolitan areas’ net migration gains exceeded their share of the state’s total population. 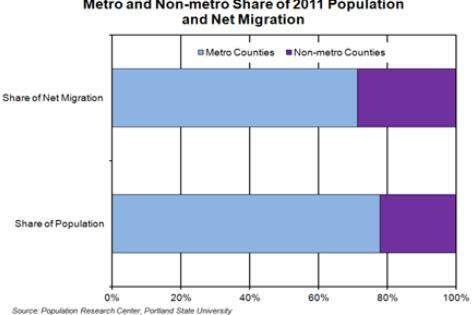 While Oregon’s non-metropolitan counties captured a slightly higher share of net migration than their portion of the population in 2011, not all of these counties saw population growth (Figure 1). In Sherman County, the population remained level. Seven other non-metro counties experienced population declines: Crook (-123); Coos (-83); Harney (-47); Curry (-29); Wallowa (-13); Lake (-10); and Wheeler (-6). Five of these counties – Wheeler, Lake, Wallowa, Curry, and Coos – gained population through net migration between 2010 and 2011. At the same time, the natural “increase” showed that the number of deaths outweighed the number of births, which actually left a net loss. That decline even outpaced net migration gains for each of these counties, which resulted in the overall population reductions. In Harney and Crook counties, both the net migration and natural increase reflected declines in 2011.